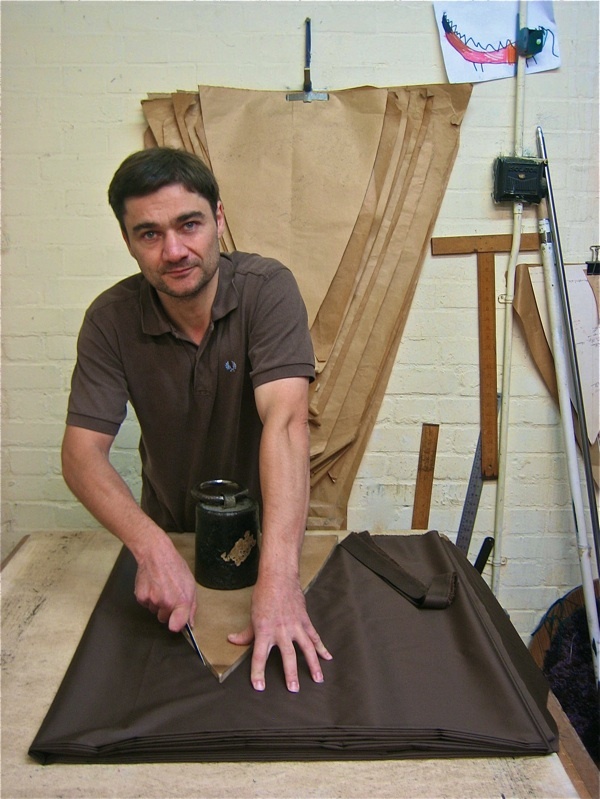 This is Richard Ince, sixth generation umbrella maker and proprietor of James Ince & Sons, the oldest established umbrella makers in Britain, founded in Spitalfields in 1805. 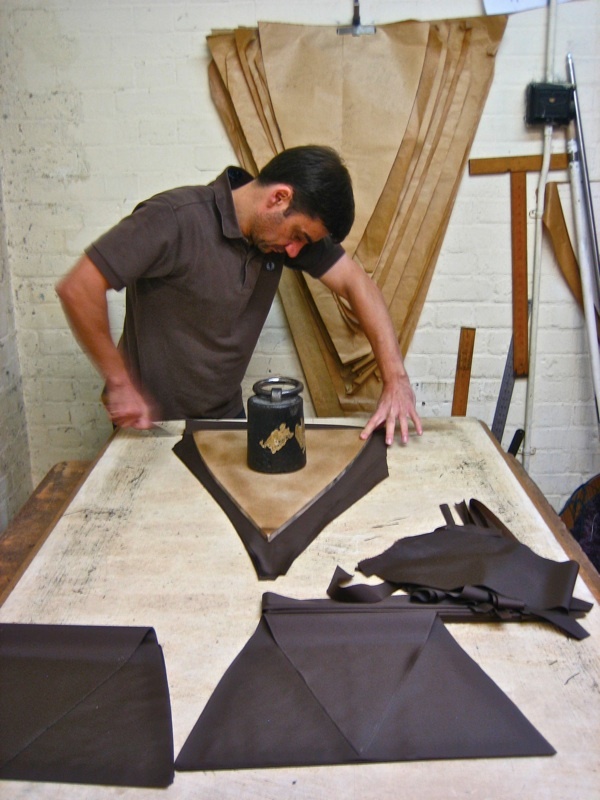 He is seen here cutting the covers for the manufacture of Albert the Umbrella, his collaboration with Ally Capellino, the bag lady of Shoreditch. It was my pleasure to introduce Ally and Richard to each other recently, and Albert is the happy outcome. At the end of the Summer, Ally cycled up from her studio in Calvert Avenue to Richard’s umbrella factory in Vyner St next to the canal. 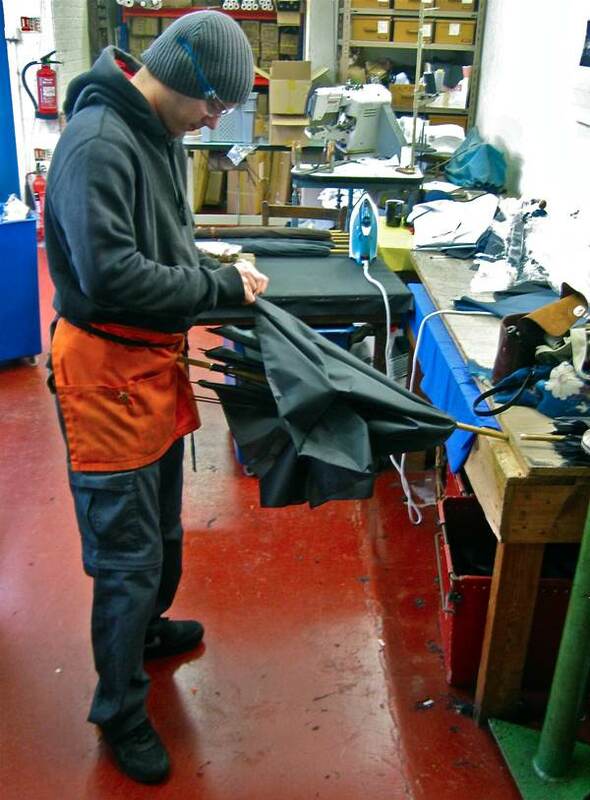 Behind a nondescript facade, Richard makes umbrellas here by hand in the same way his family have done for generations, still using many of the old tools and equipment from their former factory in Spitalfields. The cutting table in the picture above was salvaged after an incendiary bomb hit in World War II and is charred underneath, evidencing its dramatic history. Even the weight that Richard uses to hold the template in place while cutting the covers has been in the business at least three generations. 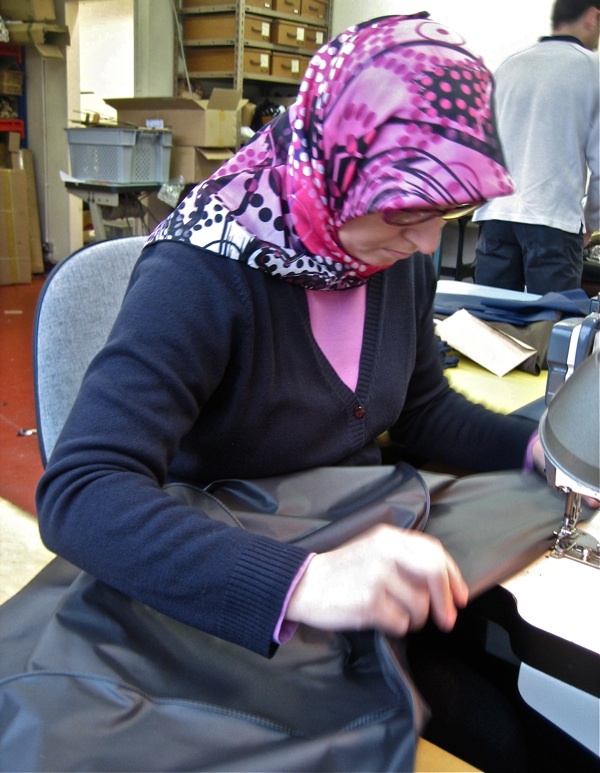 Ally – a designer with a fascination for the technical processes of making things – was immediately intrigued by Richard’s factory and, within half an hour, she was selecting fabrics and considering what kind of umbrella might complement the elegant simplicity of her bags. 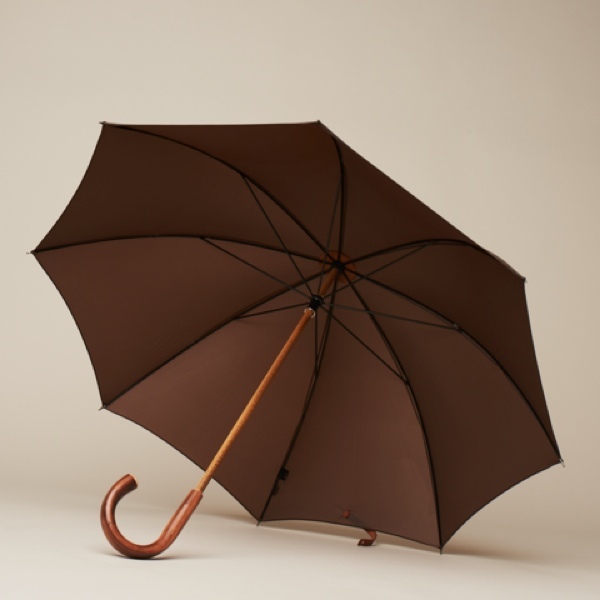 The result is a model of understatement – with a beechwood shaft, a chestnut handle, copper handsprings and discreet leather detailing, Albert the Umbrella sports a plain cover of soft grey or brown. 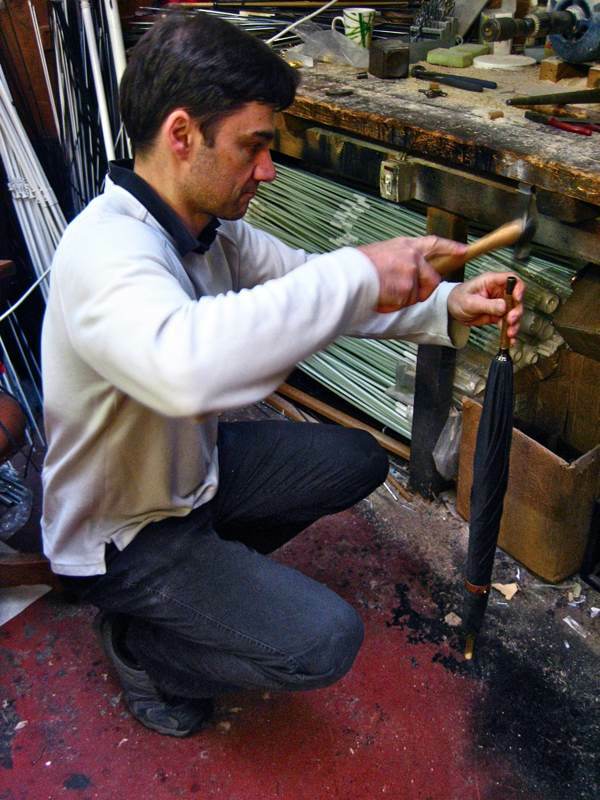 A few weeks ago, I visited the factory when Terry Coleman, the East End’s most senior umbrella maker, came in to fit the copper handsprings for Ally’s umbrellas, using an old stock of springs that were manufactured in the nineteen fifties. Then, last week, I returned to see Richard cut the covers and follow the process to completion. The machinist sewed the triangular pieces together in pairs and then niftily combined them to make the eight-panelled cover. Next, the metal tips were attached, then the cover was sewn to the frame and the leather strip which holds the umbrella furled was stitched in place. Finally Richard himself fitted the metal ferrule and the handles, and – Hey Presto! 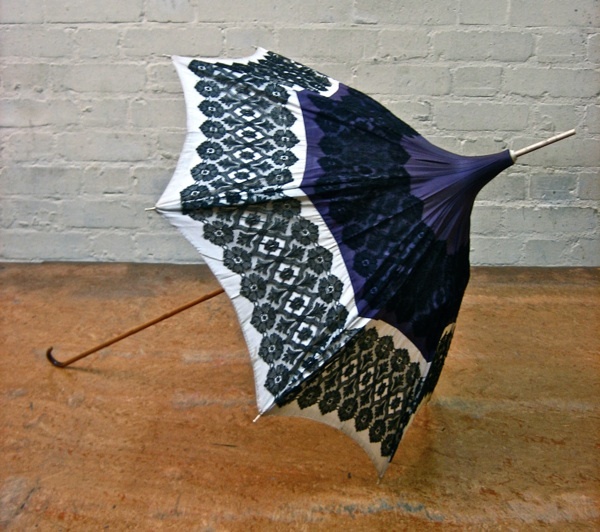 – a new umbrella by James Ince & Sons, designed by Ally Capellino and carrying a little bit of the history of the East End with it. Since most of the archives of the family business were destroyed in the London Blitz, Richard has begun collecting examples of his forebears’ handiwork ,and he brought out some magnificent dusty specimens and laid them on the cutting table for me to photograph. At first, he showed me snazzy patterned umbrellas from the fifties and forties, and then cool colonial sunshades from the thirties. He has a stack of huge old patio umbrellas, all faded by Summers long gone – even an early fishing umbrella from the very beginning of the twentieth century – that we did not venture to open in the tiny workshop. Even as I was taking my pictures, Richard produced more and more umbrellas, and unfurled them to magical effect. 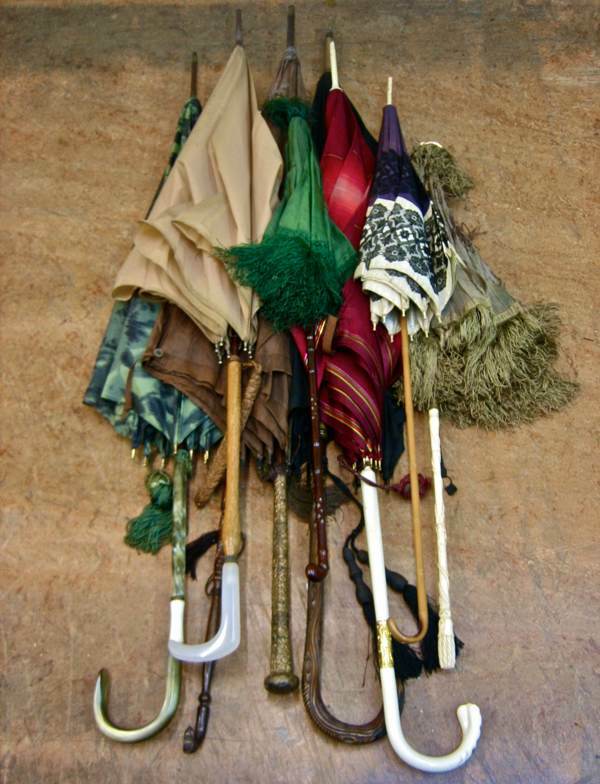 He produced parasols and carriage umbrellas from the nineteenth century, many in tattered silk and whalebone yet still luxuriant in their colour and design. 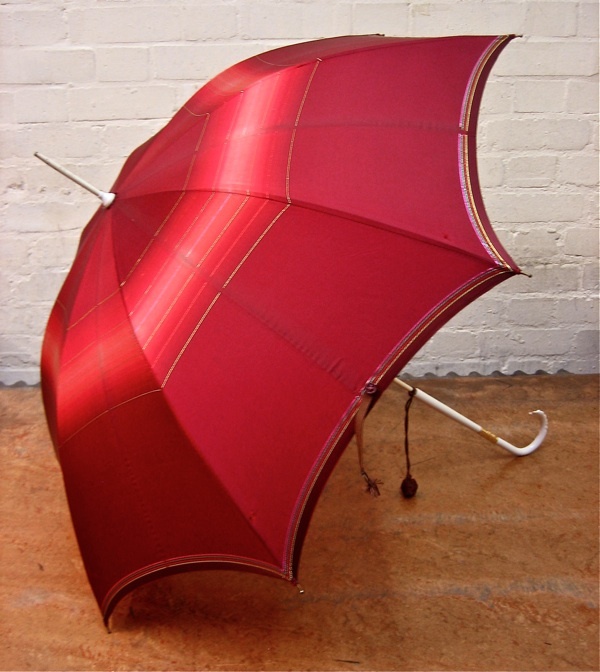 He produced umbrellas with exquisite handles and unusual frames. It was a whole lost world of umbrellas. A naturally modest man who carries his expertise lightly, Richard probably knows more about umbrellas than anyone alive, yet he does not advertise that he makes the trick umbrellas for Mary Poppins and Hagrid. 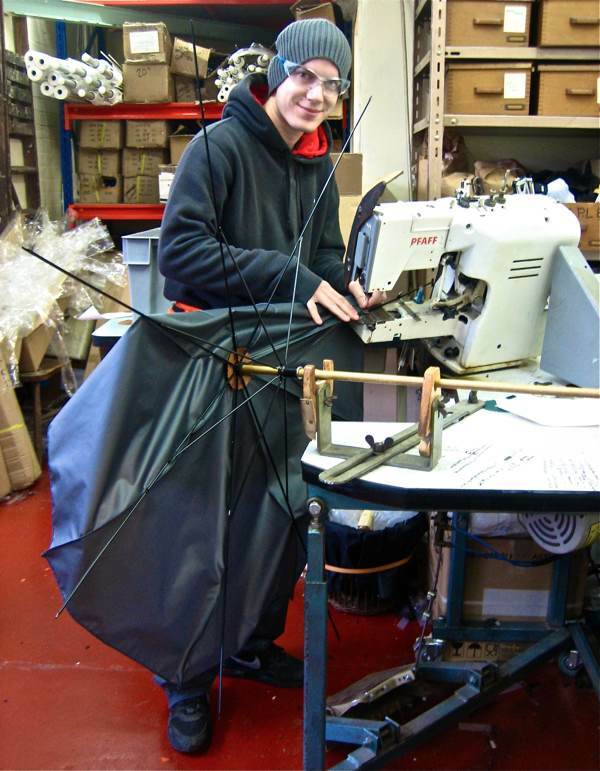 In fact, when Richard manufactures umbrellas, he does not always sew his “James Ince & Sons” label in them. So I am very proud to have been the one to put Ally Capellino and James Ince & Sons together and announce that – as a result – you can now go into a shop in the East End and buy an umbrella made by hand in the East End, by the oldest umbrella maker in this country. Ladies & Gentlemen, please welcome Albert the Umbrella! Sewing the cover to the frame. 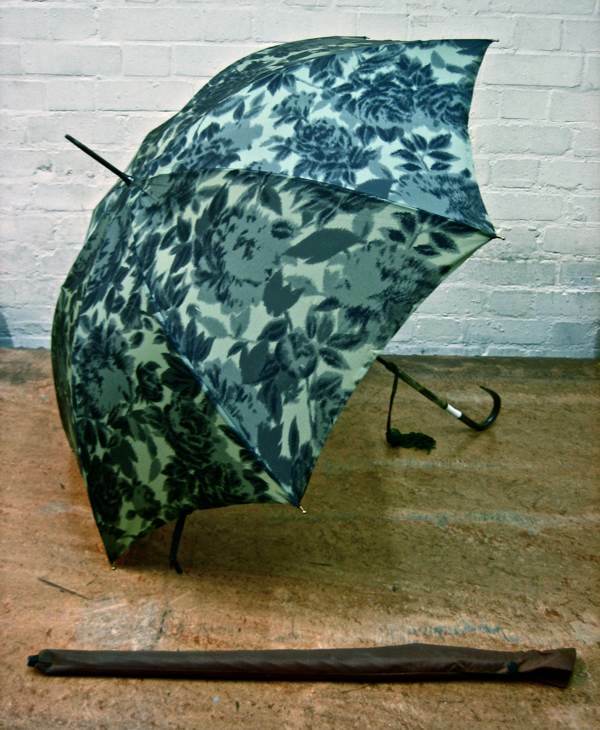 1950s art silk umbrella by James Ince & Sons Ltd.
1950s umbrella with cover by James Ince & Sons Ltd.
An unusually structured decorative frame from the early twentieth century. Silk parasol from the 1880s. Silk parasol from the 1850s. Nineteenth century silk umbrellas with frames made of whalebone. From Richard Ince’s personal collection. 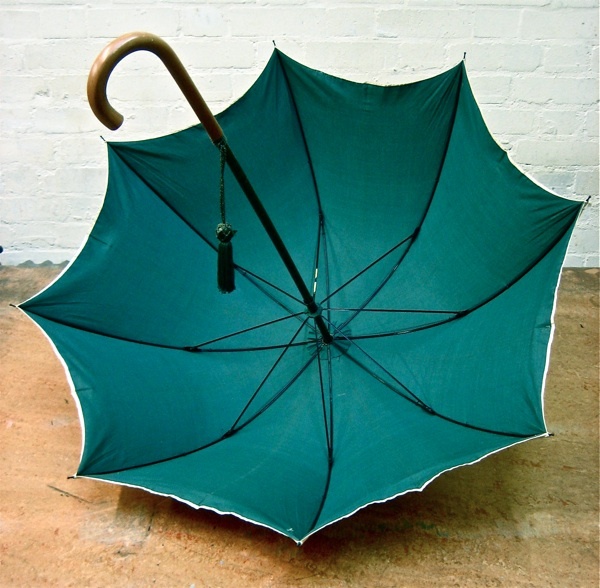 Albert the Umbrella, designed by Ally Capellino manufactured by James Ince & Sons. 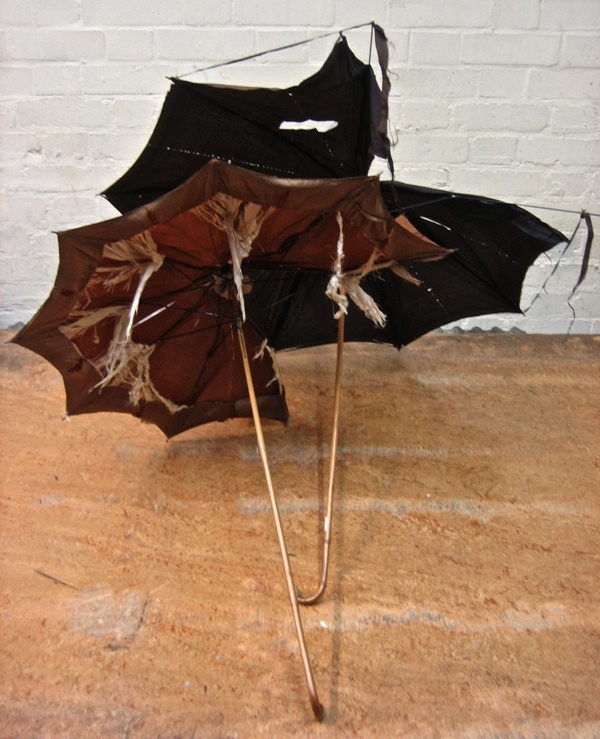 Albert the Umbrella is available in either brown or grey, and for sale exclusively at Ally Capellino’s shops in Calvert Avenue and Golborne Rd. love albert, love the heavenly green 1850s parasol even better. sun is so bad for one’s skin! Reminding me of what you said about not belonging here until you’d shaken the hand of Paul Gardner. And there we are, our new supplier works part-time at Ally Cappellino. Two umbrella makers in such a small area? That’s wonderful, as are the umbrellas themselves. Sun bad for one’s skin? Maybe, but surely rain is bad for the morale? Such lovely umbrellas raise the spirits. Hope you don’t bring a load of bad luck opening all those umbrellas inside. Great post. Lovely to know that there are still craftsmen operating in places like Vyner Street. I love the art galleries there, but it’s good to know that the old businesses are still there too. I hope they don’t get driven out by property developers who are bound to be sniffing around Vyner Street as we speak. Big up British manufacturing. Ally Capellino is great; I’ve got one of her canvas fishing style bags from the Tate. I’ve never been into umbrellas before – preferring the idea of sunshades somehow – but this post has made me see the beauty in them. I have my heart set on an Albert! Absolutely fantastic – style, quality, heritage and British-made, what’s not to love? Hello, I’m Jane’s new supplier / P/T Ally Capellino girl! I’ve spent the day at the Ally Capellino studio talking about our new Albert the brolly to our lovely faithful customers and avid readers of this ‘ere site, via Facebook and the such. Late in the day I popped into the shop take some photos of him in situ, and found he’s almost sold out, in 1 day! Thank you Gentle Author for the wonderful article and view of the Ince workshop. It was great to meet you last week, after being an avid reader for the last 2 years, it was a real joy. Jane, I went and met the lovely Paul Gardener today and came back laden with bags. I was just popping on here to grab the link to the ‘Paul’s Collection’ article to tweet and recommend his great shop and spotted your comment. Yet again I visit this site and feel all warm and gooey. Knowing that we live in a such a friendly community in Spitalfields, hurray for that and the Gentle Author for bringing us together. I have (more or less) an umbrella fetish. And I have my eye on the ‘unusually structured’ early 20thC hobby – the one shaped like a minaret. And Margaret – “surely rain is bad for the morale?” Oh no! No, no, NO! Not never no how. Rain is balm. Rain is beautiful. Rain is the absolute shiz. As somebody who collects and restores antique parasols – it’s wonderful to see an original manufacturer in operation – and still doing a lot of things as they were done in the nineteenth century. The photo of Mr. Ince at the cutting table is like a little window to the 1850s, as the procedure was pretty much identical for both the parasol and the umbrella. 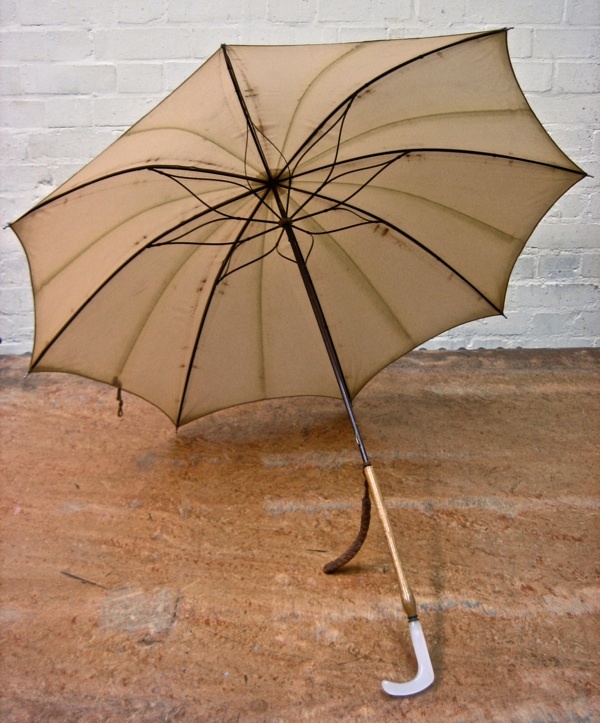 With one of the parasols I restored, I was able to trace its origins to a firm just north of Spitalfields, in Hackney, to the early 1870s through the patent for its hinge mechanism. Another I’ve yet to solidly nail down, but I’m thinking it was made just to the south of the former Ince factory, at a firm that once was located in Whitechapel, but folded in 1875. Mr. Ince’s parasol collection is enviable – my two favorites being the green silk 1850s example, and the printed white/purple silk pagoda. It’d be great to talk parasols with him! Just started looking around for parasol restorers as Ive acquired a gorgeous silk one, silver hammered handle with tiny seed pearls. The gold coloured slider thingy, sorry Im really ignorant, is engraved with Briggs and Son London. I would really appreciate it if someone could help me in my bid to restore this to its former glory. The silk is badly split, but its so beautiful I cant bring myself to throw it away, such glorious colour and woven pattern. If there is anyone who would be interested plse mail me. I would be very grateful to hear from you. 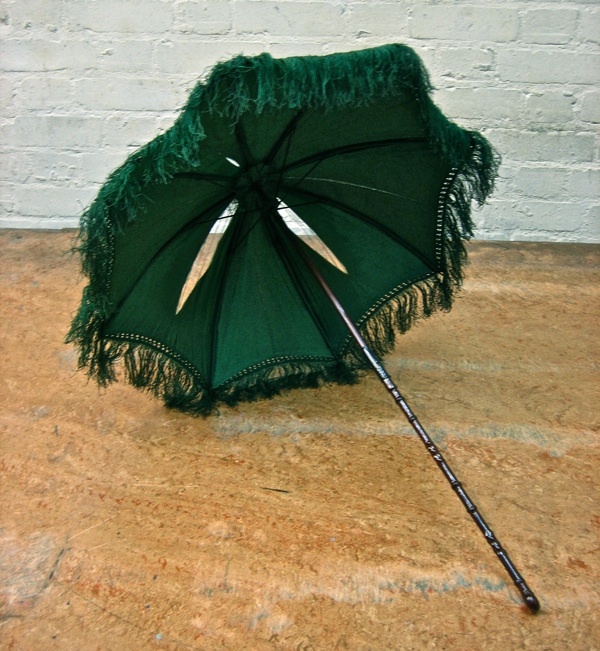 My husband has found a parasol with double fabric – outer green – inner green patterned. The handle is metal and detachable with a gem in the bottom – very like 4th from left in picture of Richard Inces personal collection. Can you shine any light on how old it is etc. It has me intrigued. It is so beautiful and in perfect condition. 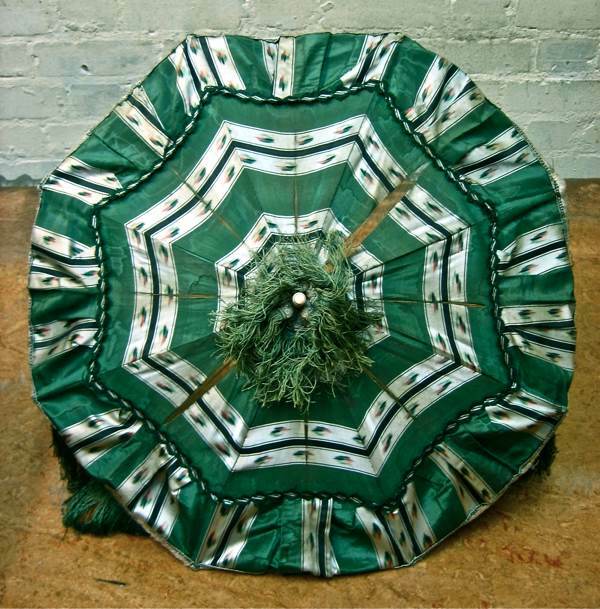 These umbrellas could probably fetch a really high price at auctions.